I had a truly magical experience at McWay Cove in Big Sur this past September. A warm, gentle breeze was blowing, the sounds of waves and falls, and the bustle insects and birds in the trees behind me. The sky was as clear as I've ever seen it on the coast, and even though it was a new moon, the stars and Milky Way provided enough light for the foreground. 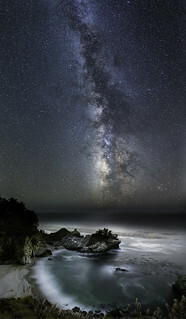 The Milky Way was truly breathtaking, clearly visible all the way to the horizon, and perfectly aligned over the cove. While I shot for a couple of hours from this particular spot, this 9 picture panorama that I took around 9:20 PM turned out to be my favorite. Though I did run into one other night sky photographer there, I wish more people could have experienced it! Taken with my Canon 6D at ISO 6400 and Rokinon 24mm at f/2. Shutter speeds were all 20 seconds, with the exception of the bottom image, which was exposed for 2 minutes.